Action buttons are a new Instagram feature that lets you put a button directly on your profile page. 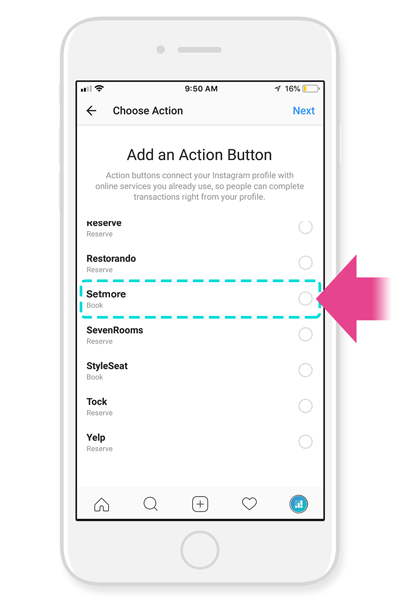 When clicked, the button can do any number of preferred actions, such as opening your public Booking Page within Instagram, thereby enabling customers to schedule an appointment directly to your Setmore calendar while staying within the native Instagram app. Using Instagram for business isn’t just about paid ads! You can post your own photos to showcase your work or other special promotions, for free. It doesn’t require any professional photography skills either (fun fact: most Android and iOS smartphones, in the hands of someone without professional training, have a camera that’s good enough to rival digital cameras that otherwise have a hefty price tag). This is a great way to connect with your followers and customers online, while giving them another avenue to reach out with questions or feedback. Now that you can also give followers and customers the option to book an appointment directly from your Instagram profile, without having to open a separate browser tab or another app, you can get even more value from Instagram. Your Instagram feed can work in tandem with your website and Facebook profile to give customers even more ways to schedule an appointment with you. You should have an Instagram business profile (personal profiles won’t do), and you should have a Setmore account. Business profiles are only slightly different from a personal account in that you can post your business hours and contact information, such as phone number or email address. Within your Setmore account, you should also spend some time to fill out your Booking Page by uploading a logo, listing your contact information, and uploading thumbnails for your staff profiles and service offerings. The more information, the better – you’ll be painting a picture for your followers about what services you offer and why they should book an appointment. Note: you can also find these instructions on the Setmore support website. Log into Instagram on your smartphone and tap Edit Profile. Scroll down and tap Contact Options. Tap “Add an action button >”. Select Setmore from the list of options, and tap Next in the top right corner. Type or paste the web address for your Setmore Booking Page here, and tap Done in the top right corner. The “Book” button will appear on your Instagram profile. Now when customers tap this button, your Booking Page will open within Instagram and they can schedule an appointment with you, without having to open a browser tab or leave the Instagram app. New appointments will appear on your Setmore calendar, and if you have staff email alerts enabled, you’ll also receive an email notification informing you that a new appointment was booked. Read our guide on Instagram best practices – This guide provides tips and tricks for encouraging your followers to book their first appointment, along with some royalty-free image templates that you can download to your phone and post to Instagram. Hi September, what’s happening when you try to add it? The booking button just doesn’t appear when you add it. Chanté, what are you seeing on your end? If you want to post your Instagram handle, I can verify from my phone. Typically the Book button will appear on your profile page, center left, below your bio information and just above your pics. I’ve walked a few people through it already, it can be hard to miss, but it’s there. Where can I find my link to my Setmore page. When I try to copy and paste it from the share option in the settings it doesn’t work! Hi Carly, I just emailed it to you. Let me know if that works or doesn’t work. Thanks! Hi Nikki, if you feel comfortable doing so, you can post your Instagram handle here and I can take a look from my end. Once you complete the integration, the Book button will appear on your Instagram page, center left, below your bio information and above your pictures. Also, double check that you’ve got the right Booking Page URL in there. Thanks! Hi Mike, glad to hear the button is working out! As for multiple locations – Setmore doesn’t currently have any plans to implement this feature in an official capacity. So we’ll have to continue using work-arounds. So, in your case I’d recommend considering multiple Setmore accounts, one for each location. Then differentiate between locations on your website. I hope that helps!